The motivation behind this introduction is to feature the known and deep impact subjected to the Nipah Virus (NiV). Principally concentrating on preventive measures and the treatment of the Nipah Virus. NiV is an individual from the family Paramyxoviridae, class Henipavirus. NiV was at first recognized in 1999, amid a flare-up of Encephalitis and respiratory sickness among pig ranchers and individuals with close contact with pigs in Malaysia and Singapore. Nipah infection caused a generally gentle ailment in pigs, yet almost 300 human cases with more than 100 passings were accounted for in 1999. Not just in Malaysia its spread around the world. A case-controlled survey ponder is directed to decide word related hazard factors for disease. Contact with live pigs, earmarks of being the essential hazard factor for human Nipah infection disease. Coordinate contact with life, possibly contaminated pigs ought to be limited to forestall transmission of this conceivably lethal ZOONOSIS to people. Understanding the significance and in light of specific records, it is an endeavor to assemble it to diagram the qualities and to be worried about this issue. This essential survey is gone for giving a knowledge into this fatal flare-up and to bring it into concern. Key Words: Zoonosis, Transmission, Nipah Infection, Preventive Measures, Obscure Impact, Treatment and Review. Nipah infection is another paramyxovirus known to contaminate pigs, canines, people, and, perhaps, bats. By 27 April 1999, the Malaysian Ministry of Health had reports of 257 febrile encephalitis cases, including 100 passing’s. The lion's share of cases had lab proof of Nipah infection contamination and most happened in the territory of Negeri Sembilan. Pigs were involved as the essential wellspring of human contamination. Most cases had guide presentation to pigs, and viral separates got from pigs and people had the same nucleotide sequences. 1 It is an outstanding issue worldwide and has influenced India too. This case-controlled diagram examines composed to pick word related hazard factors for infirmity which is caused by the Nipah Virus. Contact with live pigs are stores of being the most significant risk factor for human Nipah pollution ailment. Encourage contact with life, conceivably sullied pigs ought to be compelled to block transmission of this perhaps savage ZOONOSIS to people. Understanding the vitality and in light of specific records, it is an endeavor to gather it to outline the qualities and to be worried over this issue. Malady with Nipah contamination is connected with encephalitis (irritation of the cerebrum). After the introduction and an incubating time of 5 to 14 days, illness presents with 3-14 long stretches of fever and cerebral agony, trailed by sluggishness, bewilderment and mental confusion. These signs and signs can progress to daze like state inside 24-48 hours. A couple of patients have a respiratory infection amid the early bit of their defilements, and half of the patients giving extraordinary neurological proposals gave pneumonic insights furthermore. During the Nipah disease affliction scene in 1998-99, 265 patients were sullied with the contamination. Around 40% of those patients who entered recuperating focuses on certifiable uneasy illness passed on from the ailment. Whole deal sequelae following Nipah disease defilement have been noted, including tireless fits and personality changes. Inactive maladies with coming about reactivation of Nipah disease and death have similarly been represented months and even quite a while after introduction. The ascent of NiV into the pig people and in this way into the human masses is acknowledged to be a result of changes in normal conditions. Urbanization, deforestation, and drought realizing an insufficiency of advantages for bat masses could have compelled bats to move from their essential living spaces to rural districts. Among the components that add to the ailment ascend in Malaysia is the establishment of pig develops inside the extent of the standard host that provoked the basic introduction into the pig people. The upkeep of high densities of pigs incited the brisk dispersal of the sullying inside close-by pig masses, and the vehicle of pigs to other geographic regions for business provoked the quick spread of infirmity in pigs in southern Malaysia and Singapore. This critical examination is a way to give data into this dangerous emit and to bring it into concern. The proximity of high thickness, opening up have people empowered transmission of the disease to human. Amid January and February of 2001, an episode of febrile ailment with adjusted sensorium was seen in Siliguri, West Bengal, India. Siliguri is a critical business focus with a populace of ≈500,000. It is close outskirts with China, Bangladesh, Nepal, and Sikkim. The flare-up happened among hospitalized patients, family contacts of the patients, and restorative staff of 4 doctor's facilities. Japanese encephalitis, which is endemic around there, was at first suspected. However, the age assembles influenced, and the epidemiologic highlights recommended another infection. Research facility examinations directed at the season of the flare-up neglected to distinguish an irresistible operator. Nipah infection (NiV), an as of late emanant, zoonotic paramyxovirus, was ensnared as the reason for an exceedingly deadly (case-casualty proportion 38%– 75%), febrile human encephalitis in Malaysia and Singapore in 1999 and Bangladesh amid the winters of 2001, 2003, and 2004. The regular repository of NiV is attempted to be fruit bats of the sort Pteropus. Proof of NiV disease was identified in these bats in Malaysia, Bangladesh, and Cambodia. In the Malaysian flare-up, NiV was brought into the pig populace, and the vast majority of the human cases came about because of introduction to sick pigs. In any case, a middle of the road creature has been not distinguished amid the Bangladesh episodes, which recommends that the infection was transmitted either individually or in a roundabout way from contaminated bats to people. Human-to-human transmission of NiV was additionally archived amid the episode in Faridpur, Bangladesh. Since the clinical indications of the cases in Siliguri were like those of NiV cases in Bangladesh, and because Siliguri is close influenced regions in Bangladesh, a review investigation of clinical examples was embraced to decide whether NiV was related with the Siliguri outbreak. 5 Not just in India yet additionally influenced in the neighboring nation too is influenced. Table 1: Date, location and number of cases Niv virus. Oral administration of favipiravir completely shields from deadly Nipah infection disease in the hamster demonstrate. Favipiravir has been exhibited to diminish mortality in different exploratory models of viral hemorrhagic fever, encephalitis, or respiratory malady. To assess the in vivo viability of favipiravir against NiV-M, we used the Syrian hamster display which intently reflects most parts of human ailment, for example, far-reaching vasculitis, pneumonia, and encephalitis and has been generally acknowledged for the assessment of antiviral therapeutics and antibody hopefuls. Hamsters were tainted with a terminal portion of 104 PFU NiV-M using the intraperitoneal (i.p.) course like past examinations and treatment was started following contamination. Favipiravir was controlled twice every day utilizing the perioral (p.o.) course for 14 days, again like past investigations assessing the antiviral action of favipiravir. On test day, a stacking portion of 600 mg/kg/d was directed following disease, trailed by 300 mg/kg/d on days 1– 13. A similar timetable with vehicle dosed control creatures as it were. All vehicle-treated NiV-tainted creatures consistently created clinical indications of sickness including hyperreflexia, ataxia, irregular breathing, and dormancy and surrendered to malady or were others consciously euthanized on days 5 or 6 PI. Creatures treated with favipiravir did not create clinical indications of sickness throughout the investigation through 42 days of post disease. Besides, weight information uncovered soak weight reduction before death or killing in vehicle-treated creatures, while favipiravir-treated creatures consistently put on load all through the length of the examination. Infection titrations from tissues were uncertain as we were just ready to recoup possible infection in one of the four vehicle-treated creatures, yet no infection was identified in the favipiravir-treated gathering (information not appeared). Constant RT-PCR for the viral P quality was directed on minds, spleens, and lungs to think about viral load between deadly creatures that were euthanized and survivors. Not surprisingly, large amounts of viral P quality articulation were recognized in each of the three tissues in the vehicle-just controls contrasted with favipiravir-treated creatures, where no popular RNA was distinguished. Two of five survivors created killing neutralizer titers (PRNT50s) of >80 and >1280, separately, while the staying three survivors had titers of <20. These outcomes show that favipiravir regulated twice day by day p.o. starting following disease is very strong in forestalling NiV-instigated grimness and mortality in the hamster demonstrate. Association of favipiravir subcutaneously shields hamsters from destructive Nipah disease defilement. To choose the sufficiency of once to step by step subcutaneous (s.c.) association of favipiravir, for instance, starting late used in a Lassa disease (LASV) guinea pig model33, hamsters were polluted with a fatal segment of 104 PFU NiV-M through the i.p. course and treatment were begun rapidly after infection. Like the oral association think about portrayed more than, a stacking bit of 600 mg/kg/d was controlled rapidly after pollution, trailed by 300 mg/kg/d on days 1– 13. All vehicle-treated animals ended up being wiped out inside 7 DPI and demonstrated signs of loss of movement, ataxia, and sporadic unwinding. Favipiravir-treated animals made due until the completion of the examination (42 DPI) with no enhancement of clinical signs of ailment and reliably put on load over the range of the examination. Correspondingly similarly as with the past examination, attempts at disease titration from tissue were dubious, and RT-PCR recognized high stores of the viral P quality in every one of the three tissues assessed in non-treated animals, while the viral load in all survivors was not noticeable. Of the five enduring animals, three made slaughtering insusceptible reaction titers (two > 80 and one > 20), while the remaining two survivors had titers of <20. These results demonstrate that association of favipiravir s.c. At the point when step by step beginning right away after the illness is furthermore significantly satisfactory in maintaining a strategic distance from NiV-actuated frightfulness and mortality in the hamster model.15 Virus partition is required for finish assurance; managing NiV requires a BSL4 investigate office. Led the Swine Health Information Center by the Center for Food Safety and Public Health, School of Veterinary Medicine, Iowa State University in September 2015. Quantitative consistent polymerase chain reaction (qRT-PCR) is open, as is immunohistochemistry. Immunofluorescence may be confounded by cross-reactivity with Hendra contamination, though a couple of monoclonal antibodies are as of now available for henipavirus detachment. An underhanded protein associated immunosorbent look at (ELISA), contamination balance tests using pseudotype particles, and multiplexed microsphere measures have all been delivered to perceive antibodies to NiV at the BSL2 level.16 Another methodology which is encountering is upon Fusion Glycoprotein system. For good countermeasures and readiness, a more extensive and more far-reaching approach and venture are critically required. Notwithstanding diagnostics, therapeutics, and antibodies, reconnaissance foundation must be enhanced to recognize and confirm cases quickly, direct point by point contact following, research overflows, and better comprehend the environment of bats and Nipah infection contamination, particularly outside of flare-up situations. As vital is the requirement for social change: nearby networks must be better upheld to guarantee disease anticipation and control measures in wellbeing offices to diminish transmission, and to lead the network commitment and instruction required to alter conduct and decrease chance. We should notice that Nipah infection requests an expansive, long haul system and pandemic arrangement. Favipiravir treatment results in diminished viral antigen and histopathological changes. With the end goal to decide the neurotic changes present in favipiravir-treated NiV-M-contaminated hamsters, we inspected cerebrum, spleen, and lung gathered from euthanized creatures amid the examination and survivors at 42 DPI utilizing H&E stains and IHC against NiV nucleoprotein. Vehicle-treated creatures showed trademark obsessive sores of NiV disease: Lungs showed perivascular penetration of provocative cells, and NiV antigens were recognized in endothelial cells, which infrequently shaped syncytia, and also in smooth muscle cells of pneumonic vessels. Gentle to direct interstitial pneumonia with alveolar edema or drain and intermittent increment in sort II pneumocytes were likewise observed. In the spleen, follicles were less unmistakable, and the red mash string showed necrotic territories scattered with mononuclear or reticular cells with NiV antigens. In cerebrums, meningitis with a penetration of neutrophils and mononuclear cells was found, and viral antigens were identified in mononuclear cells with lengthened cytoplasm in meninges and every so often in neurons in the parenchyma. Tissues of creatures which were treated with favipiravir, either p.o. or on the other hand s.c., were comparative: no remarkable discoveries of sicknesses were distinguished in minds, lungs, and spleens in the H&E areas. None of the treated hamsters showed perceptible NiV antigens in cerebrums, lungs, or spleen spleens. Lungs of treated hamsters did not demonstrate cell penetration in pneumonic veins, albeit gentle union of lung parenchyma was watched. I gratefully acknowledge the encouragement and support extended by Dr. Biplab Debnath Sir for his real guidance during the investigations and of course for his motivation. I sincerely thank my parents for moral support and for the economic help. 1. Centers for Disease Control and Prevention. Outbreak of Hendra-like virus—Malaysia and Singapore, 1998–1999. MMWR Morb MortalWkly Rep. 1999;48:265–9. 5. Chadha Mandeep S., Comer James A., Lowe Luis, Rota Paul A., Rollin Pierre E., Bellini William J., Ksiazek Thomas G., Mishra Akhilesh C.. Nipah Virus-associated Encephalitis Outbreak, Siliguri, India. Emerging Infectious Diseases. 2006;12(2):235 – 240. 6. Harcourt Brian H., Lowe Luis, Tamin Azaibi, Liu Xin, Bankamp Bettina, Bowden Nadine, Rollin Pierre E., Comer James A., Ksiazek Thomas G., Hossain Mohammed Jahangir, Gurley Emily S., Breiman Robert F., Bellini William J., Rota Paul A.. Genetic Characterization of Nipah Virus, Bangladesh- 2004. Emerging Infectious Diseases. 2005; 11(10):1594 – 1597. 7. Henipah Virus Details – Wiki – https://en.wikipedia.org/wiki/Henipavirus . 8. Kulkarni D.D, Tosh C., Venkatesh G., Kumar D. Senthil. Nipah Virus Infection: Current Scenario. 2013; 24(3):398-408. 9. Goh Khean Jin, Tan Chong Tin, Chew Nee Kong, Tan Patrick Seow Koon, Kamarulzaman Adeeba, Sarji Sazilah Ahmad, Wong Kum Thong, Abdullah Basri Johan Jeet, Chua Kaw Bing, Lam Sai Kit, Clinical Features Of Nipah Virus Encephalitis Among Pig Farmers In Malaysia. The New England Journal of Medicine. 2000; 342(17):1229 – 1235. 10. Chew Madeleine H. L., Arguin Paul M., Shay David K., Goh Kee-Tai, Rollin Pierre E., Shieh Wun-Ju, Zaki Sherif R., Rota Paul A., Ling Ai-Ee, Ksiazek Thomas G., Chew Suok-Kai, Anderson Larry J.. Risk Factors for Nipah Virus Infection among Abattoir Workers in Singapore. The Journal of Infectious Diseases. 2000; 181:1760–1763. 11. Olivier Escaffre, Viktoriya Borisevich, Barry Rockx. Pathogenesis of Hendra and Nipah virus infection in humans. J Infect Dev Ctries. 2013; 7(4): 308 – 311. 12. 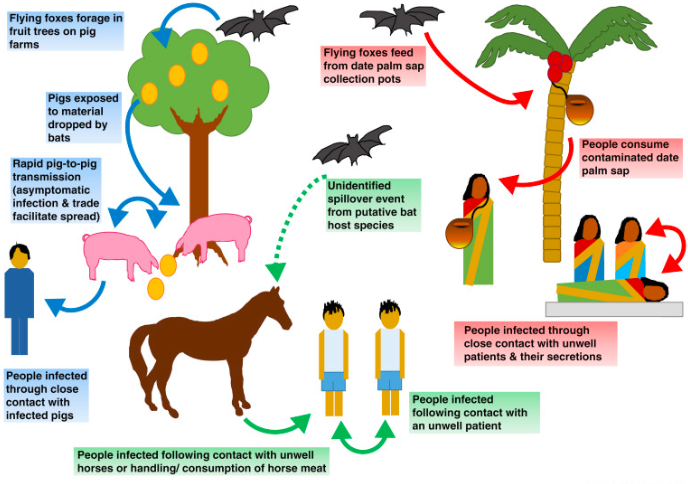 Article – Nipah Virus Infection – Nipah Virus Encephalitis, Porcine Respiratory and Encephalitis Syndrome, Porcine Respiratory and Neurologic Syndrome, Barking Pig Syndrome. 2016;1 – 9. 13. CDC - National Center for Emerging and Zoonotic Infectious Diseases - Nipah Virus (NiV). 14. World Report Lancelet. 2018; 391 : 2295. 15. 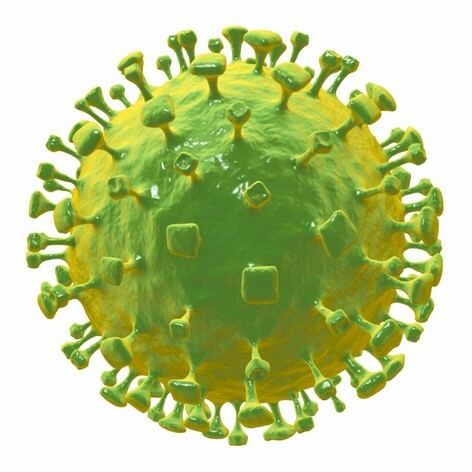 Dawes Brian E., Kalveram Birte, Ikegami Tetsuro, Juelich Terry, Smith Jennifer K., Zhang Lihong, Park Arnold, Lee Benhur, Komeno Takashi, Furuta Yousuke, Freiberg Alexander N.. Favipiravir (T-705) Protects Against Nipah Virus Infection In The Hamster Model. Scientific Reports. 2018; 8(7604):1 – 11. 16. Article – Nipah Virus – Prepared for the Swine Health Information Center By the Center for Food Security and Public Health. College of Veterinary Medicine. Iowa State University September 2015. 17. Aguilar Hector C., Ataman ZeynepAkyol, SpericuetaVanessa A., Fang Angela Q., Stroud Matthew, Negrete OscarA., Kammerer RichardA., Lee Benhur. A Novel Receptor-induced Activation Site in the NipahVirus Attachment Glycoprotein(G) Involved in Triggering the Fusion Glycoprotein(F). Journal of biological chemistry. 2009; 284(3) :1628 – 1635. 1. M.Pharm, Pharmacology, NSHM College OF Pharmaceutical Technology, NSHM Knowledge Campus, Tollygunge, Kolkata - 700053, WB. 2. Associate Professor, Department of Pharmaceutical Chemistry, Bharat Technology, Uluberia, Howrah – 711316, WB, INDIA.